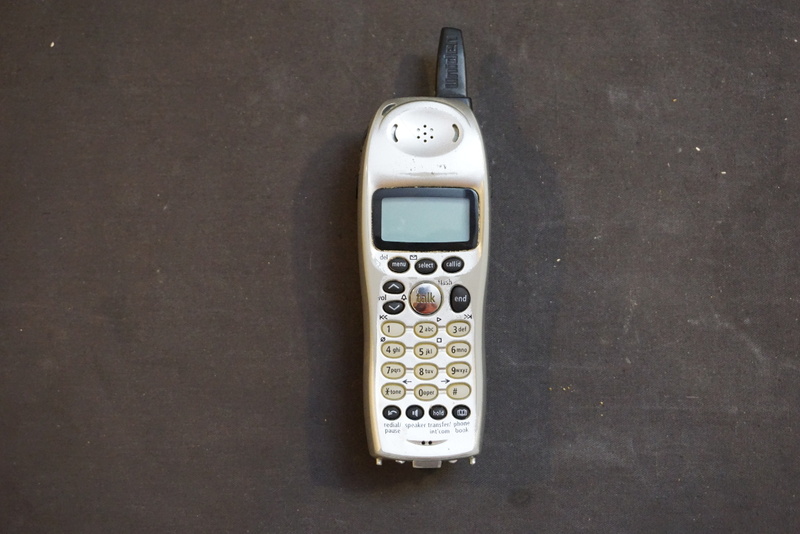 I recently upgraded my home phone system and thus was left with a couple of old Uniden DCT648-2 handsets. Most of the components inside are probably not salvageable but these handsets use 3×16 character LCDs, so it would be nice if I could reuse them in my other projects. 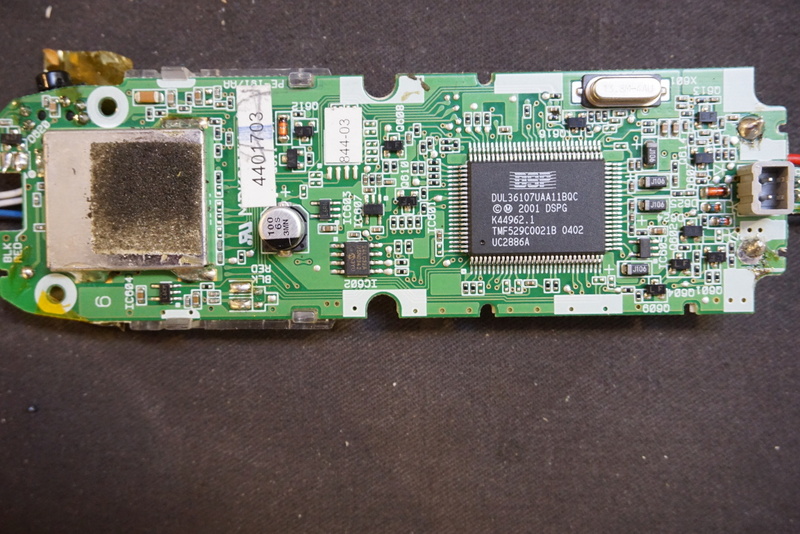 The LCD inside the DCT648-2 handset has 8 pins. This suggests that it is using some kind of serial protocol. Unfortunately, I could not find any information on the LCD used here so I decided to hook it up to a logic analyzer and see if I could reverse engineering the protocol used to drive the LCD. A few of the pins can be easily identified. Pin 2 (from left to right) is clearly connected to the circuit ground. 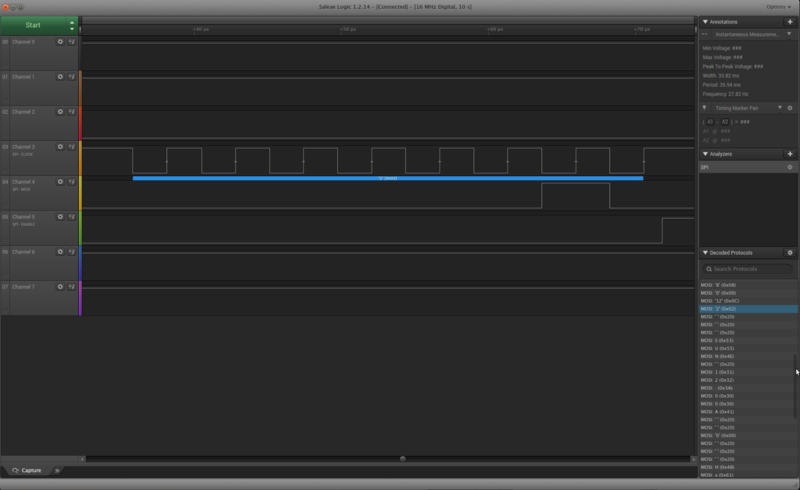 And pin 3 measures 3.3V when the phone is powered on which suggests that the LCD uses 3.3V logic. Pin 1 is roughly -2.6 with respect to the ground. If you look at the PCB carefully, you will see a capacitor is placed between pin 1 and ground. Since there is no visible trace coming out from pin 1, I think it is used solely for connecting an external capacitor for the builtin charge pump to provide the negative voltage needed by the LCD. With this information, I hooked up pin 2 through pin 8 to my logic analyzer. 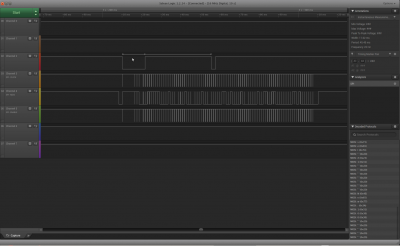 After looking at the captured data, it became clear that this LCD is using some kind of slightly modified SPI protocol. We can also easily identify that pin 6 is the SPI clock, pin 7 is the MOSI and pin 8 is the CS pin. From the captured data we can also see that the clock remains high when inactive (CPOL=1). Pin 5 doesn’t look to conform to any standard SPI signal, but as you will see shortly it is presumably used to load command to initialize the LCD. 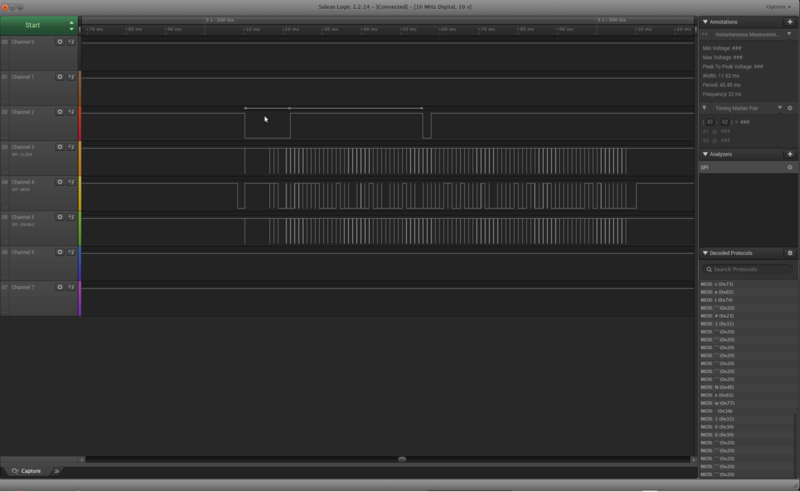 Now the only question remaining is whether the data is loaded on the leading edge or the trailing edge of the clock. After comparing the data captured using data valid on rising edge settings (CPHA=0) and data valid on trailing edge settings (CPHA=1) it became clear that CPHA=1 is used as when setting CPHA to 0 the decoded output sometimes become garbled, which suggests that the signal is not yet settled on the rising edge. So now we know the SPI mode the LCD is communicating with: CPOL=1 and CPHA=1. 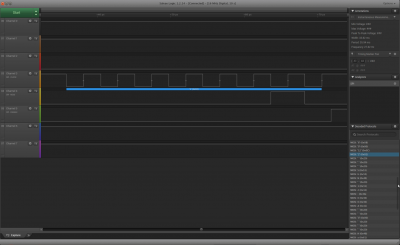 This corresponds to SPI_MODE3 in Arduino. Since the character LCD is 3×16 (48 bytes) but each frame contains 87 bytes and the actual character displayed on the LCD starts from the 40th byte so the first 39 bytes must be some kind of initialization data that prepares the LCD for data display. The first 39 bytes also do not seem to change when the display changes. The 39th byte corresponds to the last low-to-high transition of pin 2 so clearly pin 2 is used to signify the beginning of the display data. 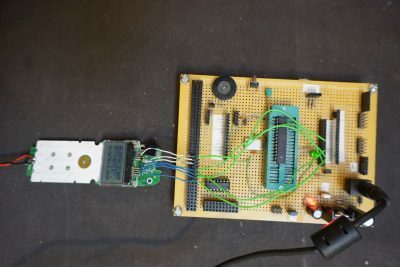 To test whether the above assumptions are correct, I used a 3.3V powered Arduino prototyping board I built a while back and wrote a simple program (see below). The code basically just output ASCII characters from 65 (“A”) and upwards until it fills all 48 spaces on the screen. Instead of mounting the LCD onto a protoboard, I simply cut the signal traces and used an ATMega328p running Arduino to talk to the display. The corresponding code I used is listed below, the 39 bytes header info is somewhat mysterious but it seems to be working just fine by sending these verbatim each time with the correct timing and command pin toggle. Finally, here is a video showing the process of this reverse engineering, you can find more information of analyzing the protocol used by this LCD in the video. Great article; thanks! I also had some Uniden handsets laying around…I’ve torn one down and gotten similar results, but not exact…my 39-byte header is different (but consistent) and the timing between bytes (and the preamble timing) is much different (slower) than what you have spelled out in your Arduino code example…did you ramp the timing up (reducing delays) to see what the best performance is? Or is that what you measured during logic analysis? I haven’t cut the traces and tried controlling the LCD directly yet…hopefully today! The timing is almost exactly what the original circuit used. That said, I did experiment with different timing and the LCD worked with a pretty wide range of clock speeds. I wish you had included a list of all the pins on the LCD and what you found them to be for. I figured out some of them from comments in the code but still can’t find them all. Did you also have to connect 3.3 volts to pin 3 and tie pin 4 high for Enable? What about connecting a capacitor to pin 1? Correct, you will need to pull up pin 3 and pin 4 to Vcc and between pin 1 and pin 2 you should put a 1uF ceramic capacitor for the charge pump. I didn’t have to make those connections as the LCD was still connected to the original board. Could you list the exact pinouts that you used for all the pins? i.e. lcd 1 -> Arduino “a”, lcd 2 -> Arduino “b”, etc. and if the power pins (5v, GND) are used while Arduino is connected. I am trying to get an old one working, and so far have only been able to either fill the screen with black rectangles or nothing at all. I unfortunately don’t have a logic analyzer so I don’t know if I need a different 39 byte header, but am hoping that you could help me eliminate the option of wiring problems. Thanks! 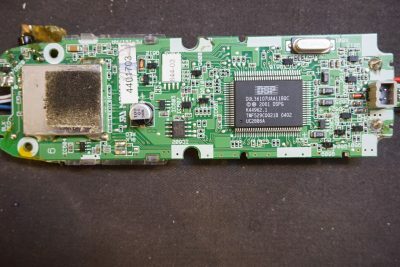 I had removed the screen from the phone, and soldered pins onto it, but when I plug it in and upload the code, nothing shows up. Would that be because I might have pins mixed up or because pins 1 and 2 both go to ground? If you look at the board, there is a cap between pin 1 and pin 2 which is used for the charge pump to provide the negative voltage needed by the LCD. So you can’t short pin 1 and 2 together. Thanks! I will change the wiring, so would I have to put pin 1 to a different place? Or do I not connect it to anything? 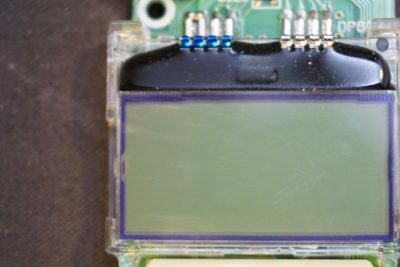 If you take a look at this picture http://www.kerrywong.com/blog/wp-content/uploads/2017/06/LCD.jpg you will see how pin 1 and 2 of the LCD are connected. Thanks, but does that mean I would have to find a capacitor that is the same as that one, or do I need to just leave pin 1 untouched? You will need to find a similar valued capacitor as it is part of the charge pump circuit, without it the LCD would not have the correct negative bias and would not work. Ok, thanks! I will try that, I might try using the capacitor from the phone even.